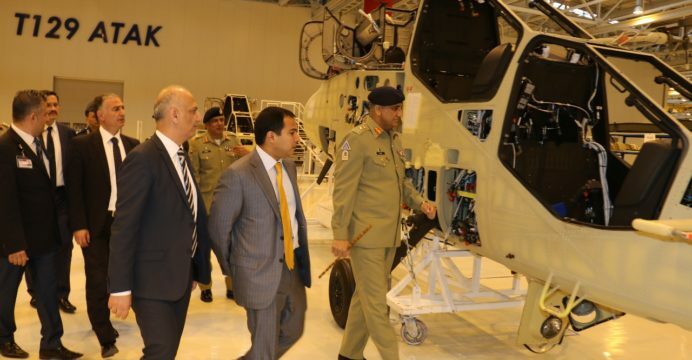 The COAS also visited Turkish Aerospace Industries (TAI), where “he was briefed about the projects being undertaken by TAI in both military and civil aviation industry.” Gen. Bajwa had also inspected – and flew in – the TAI T129 ATAK attack helicopter, which TAI is marketing to the Pakistan Army. Alongside China, Turkey is among Pakistan’s leading defence partners. Over the past decade, Ankara and Islamabad have developed programs to facilitate defence-related training, exchanges and trade. Pakistan also sees Turkey as its surrogate source for American and European technology, which Turkey produces under license or benefits from to varying degrees for its own programs. Turkey has been able to leverage its acquisition programs and scale to acquire technology transfers and export licenses. In turn, it markets the hardware to countries such as Pakistan. Sales generate additional scale, which distribute the development overhead across a higher number of units (i.e. increasing affordability of subsequent units). For example, the T129 ATAK is an upgraded variant of the Leonardo (formerly AgustaWestland) AW129 Mangusta, which Turkey selected as part of its next-generation attack helicopter program in the 2000s. Turkey acquired the Mangusta with the technology to manufacture the airframe domestically as well as to market the platform for export to third-party users. In 2016, Pakistan had evaluated the T129 as part of an apparent ‘plus one’ attack helicopter requirement to complement the heavier Bell Helicopter AH-1Z Viper, three of which are due for delivery by the end of this year. With the Chinese Z-10 as the sole active competitor, it is not clear which platform the Pakistan Army will ultimately select (assuming the program will be pursued). However, at IDEF 2017 in May, TAI signed a memorandum-of-understanding with Pakistan Aeronautical Complex (PAC), which may enable PAC to manufacture and supply T129 parts as well as assemble the helicopter should the Pakistan Army select the T129 (Aviation Week). It is likely that the offset package is being pitched to reduce the T129’s costs for Pakistan, albeit over the long-term through stimuli (via Pakistan contracting PAC for some T129 work) and exports to Turkey (for T129 parts). In a sense, the T129 could have broader implications than simply providing attack helicopters to the Army, it is also Turkey’s offer to support the Pakistan Air Force’s (PAF) Kamra Aviation City initiative by packaging a helicopter industry work with the T129 acquisition. TAI’s supporting T129 contractors Aselsan and Roketsan are also eager to engage with the Pakistan Army in the areas of electronics and munitions, respectively. In recent years, Aselsan has been supplying software defined radios to the Pakistan Army, but it is hoping to expand its activities to include electro-optical and other electronics equipment for the al-Khalid 2 tank program. Roketsan is marketing its Mizrak/UMTAS series of anti-tank guided missiles and expertise in artillery rockets and ballistic armour.